Provided photo Upper Valley Medical Center volunteer Connie Gillespey arranges holiday items in the hospital gift shop, which will host a holiday open house in the hospital lobby from 8 a.m. to 6 p.m. Tuesday, Dec. 4. 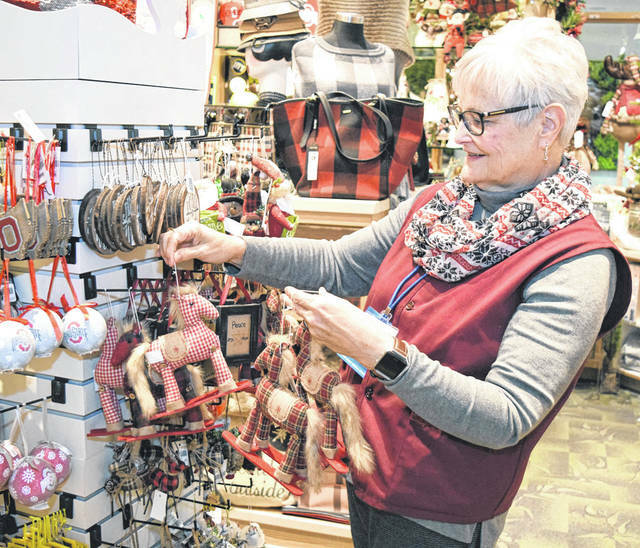 TROY — The Upper Valley Medical Center Gift Shop will host a holiday open house in the hospital lobby from 8 a.m. to 6 p.m. Tuesday, Dec. 4. Features will include 20 percent off all Christmas merchandise, buy one/get one 30 percent off clothing items, complimentary gift with minimum $20 purchase (while supplies last), and door prize drawings. Light refreshments will be served. Proceeds from this sale will benefit the Upper Valley Medical Center Volunteer Auxiliary, which supports the hospital with a volunteer force, annual scholarships, and funding for special projects and equipment. For further information, call Upper Valley Medical Center Volunteer Services at (937) 440-4995.
https://www.dailycall.com/wp-content/uploads/sites/30/2018/11/web1_UVMC-Gift-Shop-DSC_0007.jpgProvided photo Upper Valley Medical Center volunteer Connie Gillespey arranges holiday items in the hospital gift shop, which will host a holiday open house in the hospital lobby from 8 a.m. to 6 p.m. Tuesday, Dec. 4.